We have a vast number of resources for the perfect gift to match your budget. Whether a gift of gourmet foods, a cozy afghan with music and a book, a crystal votive or fabulous gift basket, we have what you'll want. Only a sampling is shown on our site and many more options can be ordered. Contact us for additional suggestions. Thanksgiving, Christmas, Chanukah, New Years. Whether for an individual, a family or an office group, we'll provide the perfect gift for saying "Happy Holidays!" We design and create gift baskets, gift boxes, stacks and towers of incredible true gourmet delicacies. We can also provide individual gifts such as lacquered art boxes, crystal, hand-crafted art glass...and more! 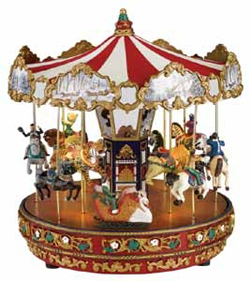 A traditional carousel with animated hand-painted figures and mirrored center column. Animals move up and down under LED spotlights as the carousel turns. Real fabric roof with Currier & Ives facade artwork. Plays 15 Christmas carols & 15 year-round classics. UL listed. AC adapter incl. Approx. 10.5" diam. Additional Musical "World's Fair" rides--carousels, parachutes, ferris wheels--and other musical gifts available. Contact us. 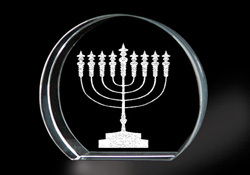 This circular piece of optical grade lead crystal shows the 3-dimensional eight-branched menorah, or "chanukiah" used to kindle Chanukah candles. Image is a hologram laser-etched within the crystal. Made of recycled glass, this 11"-sq. plate with depressed center is perfect as a serving piece or even centerpiece. See our Eco-Focused Page for the gold version shown empty. Available in clear, smoke, metallic silver, gold, red or chartreuse. Same as the silver plate above, this 11" square plate is paired with a matching 6" square metallic glass bowl (shown on black metal stand). 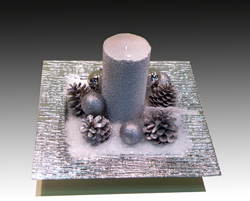 Made of recycled glass so they're both decorative and kind to the environment. Bowls can be bought separately, case packed in 4's. 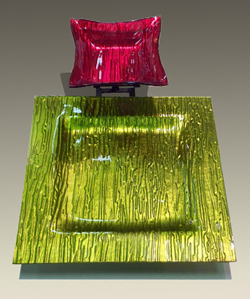 All pieces are available in clear, smoke, metallic silver, gold, red and chartreuse. Mix & match colors as you desire. Plates $12.00-$20.00 (based on color). Plate & metal stand (not shown) $25.00-$35.00. (based on glass color). Bowl with metal stand as shown: $13.00-$15.00 (based on glass color). Bowls without stand: $5.00 each. Celebrate any occasion with this combination of "open & enjoy" products for parties or gifts. 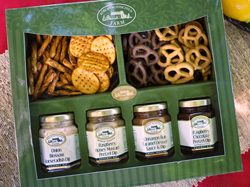 Each set contains 2 each of savory and sweet dips as well as 2 each sweet and salty dipping snacks. "I also want to let you know that we received the copies of the books at our end. They look great! We've already received several compliments from our clients, so I think this one is a winner. Thank you again for your help in selecting another great gift for our clients and hope that you have a great holiday season!" "The impressive HollyBarry House products transcend the popular notion of corporate gifts. They are relationship enhancers. In today's world, where keeping you and your business firmly entrenched in the minds of your customers is Priority One, (HBH) is a valuable resource...truly an agent of goodwill." We appreciate the imaginative designs, variety of products and excellent service.